So, you decided to visit Poland. You chose one of the most popular destinations - Krakow. You like traveling, you're interested in great architecture, museums and art galleries. You enjoy good food. But you also want to explore other options in the area. You like nature and appreciate nice landscapes. You need to get away from city hustle and bustle every now and then. So you think: "if I'm in Krakow, I'll visit Tatra mountains too". That's, without a doubt, a great choice - hiking in Poland is awesome adventure! 💙 But this idea has its drawback - everyone goes there. Together with Zakopane town Polish Tatra mountains are one of the most popular spots in Poland these days. So it's worth to consider other amazing getaways nearby Krakow. Less popular, not so crowded, but also offering nice views, beautiful nature, interesting hiking trails and fresh air. Such place would be Beskid Wyspowy - Island Beskid mountain range. You can get a shuttle bus from Cracow's to Mszana Dolna or Rabka Zdroj - they're leaving frequently from Cracow's main bus station. You can also check the available bus options here . But the easiest (and most efficient) choice would be just to rent a car or use BlaBlaCar (it got immensely popular in Poland a few years ago). No crowds - everyone hikes in Tatra mountains. Nice and easy hiking trails, suitable also for families with children. The highest peak of Island Beskid is Mogielica - it reaches 1170 metres. There's a wooden 22-metre high lookout tower on the peak, which gives better chance to admire fantastic mountainscape. Generally, hiking trails in Beskid Wyspowy aren't demanding and you can do a few peaks on one day. Which doesn't mean you can't get tired in those mountains. Our recent hiking trip to Island Beskid proved that hiking in such low mountains can be exhausting. We spent the first night on Polana Wały campsite. It's a simple campground which offers basic amenities. There are no luxurious showers or tiled toilet - everything is wooden and outdoor. There's also kitchen shed where you get warm tea and boiling water for free. For hikers without tent there are big shared tents available, but we decided to bring our own gear. What I liked the most about this campsite is the fact that it's not possible to get there by car - it's located on a meadow in the forest and we had to hike for about an hour there. Thanks to it, there were no crowds - only us and the host with his family. We sat by the campfire and then admired the moon eclipse. At 3 AM we set off to Mogielica peak , as our friends wanted to take photos of the sunrise. Me and Bartosz didn't make it to the top - instead we just contemplated amazing landscape of Beskid Wyspowy at dawn. After breakfast we climbed down to Półrzeczki village to continue our trip. We drove to Jurków village, left our friends' car there and started our 2-day hike. That day Ćwilin peak was on our radar. What I like about this mount is its wide and flat top from which we can admire vast landscape of Beskid and Tatra mountains. The blue trail leading to the top is also used by mountain bikers, but it's for experienced folks - lots of stones and roots on this trail. We were quite exhausted when we got to the youth hostel located on Śnieżnica mountain slope. I think the lack of sleep was getting to us, because the hike itself wasn't very strenuous, but we were dead tired. Also, we were woken up around 10 PM by religious singing. I guess they were singing the last songs before quiet hours, so they decided to double the volume. Anyway, what I liked about this place is that the staff was very nice and friendly and we got breakfast for free. It definitely outweighs the lack of beer. On Sunday, with our stomachs full, we set off for a long but not demanding hike to Pcim village where we left our car. Generally hiking in Island Beskid is very pleasant . There's not much height difference to do, trails are wide and safe, and there's not so many people as in other mountain ranges. 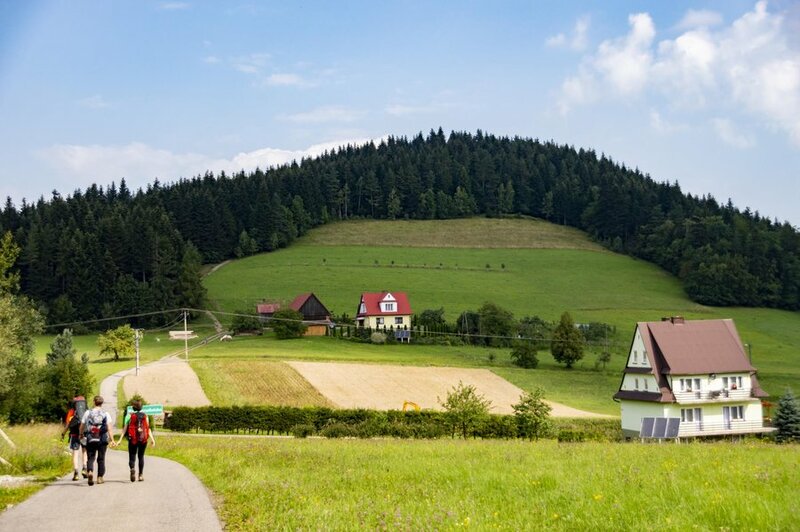 Beskid Wyspowy is very picturesque mountain range which is definitely worth visiting if you're nature aficionado and hiking lover. I need to say that after such demanding trip almost every part of my body was aching, but I felt alive. Much more alive than after a day spent in the office. It's a paradox for me, but it's always the same story. My body hurts, but my mind is refreshed, my thoughts are calmer and I'm much more energized. These are one of the most important motivations for me to hike in the mountains.